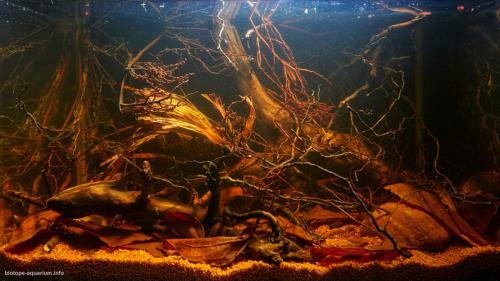 Description of decorations: Driftwood and branches forming a layout close to the nature, the gravel is fine, brown, rounded stones of reddish shades, palm and Indian almond leaves. Description of equipment: AquaEl ASAP 300 filter, AquaEl EASYHEATER 25W, LED LEDDY TUBE 6W. Water parameters: The temperature is 25°C, pH is 5.5, KH is 2, GH is 4. Description of the area surrounding the biotope: The Barito River flows in the south-east of the island of Kalimantan (Borneo). It carries its water to the Java Sea. The nature biotopes of the overwhelming number of species of fish and aquatic plants of the island of Borneo are fast streams and small rivers with clear, transparent or muddy water. Large and small rivers and streams, merging, form around themselves areas covered with water. Rivers branching out in swampy lowlands are mostly shallow due to sand and silt sediments. The Barito River provides a significant diversity of biotopes, from fast mountain streams to wetland creeks. 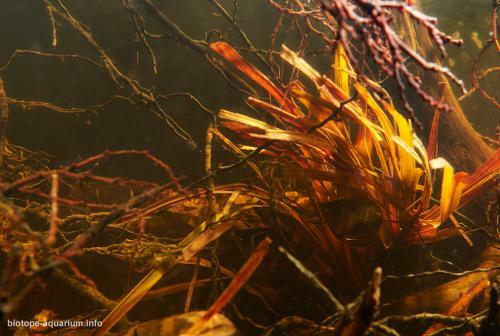 Description of the underwater landscape of the biotope: In the backwaters, the dense cover of the tropical forest practically does not let sunlight go to the surface of the water, and the bottom there is littered with numerous branches, leaves and fruits of trees. 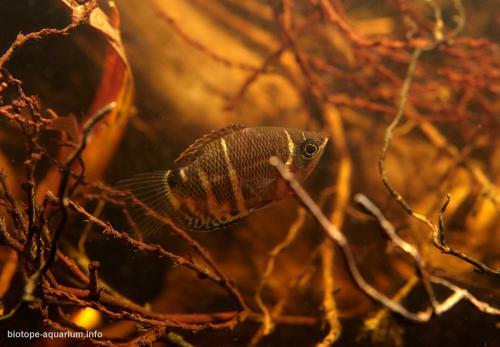 In this biotope aquarium there is a labyrinth fish, chocolate gourami (Sphaerichthys osphromenoides) living in this area. 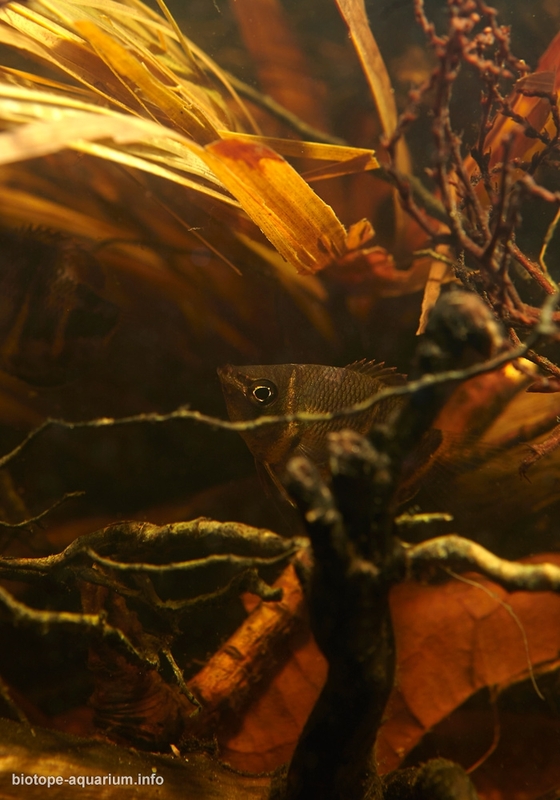 The gouramis have a labyrinth organ that allows them to breathe atmospheric air directly, complementing the low amount of oxygen getting through the gills. The coloring of chocolate gouramis allows them to be practically ivisible among sunken branches and leaves. In nature, chocolate gouramis live in groups, spawning in paires, the male carries eggs in its mouth. 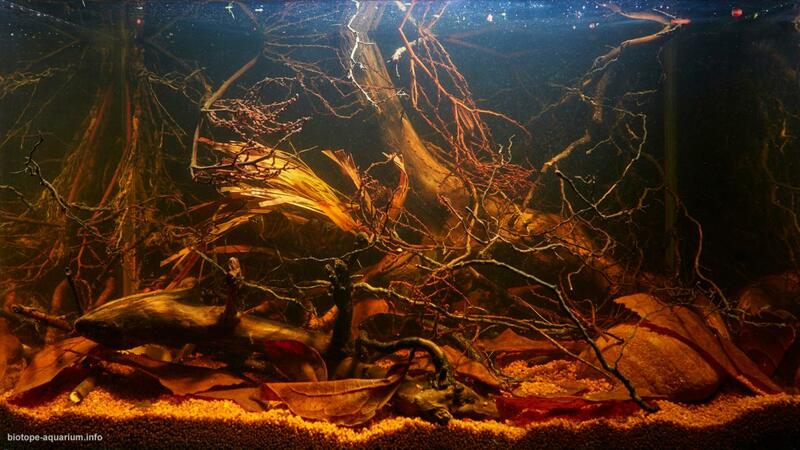 According to our observations, this species feels best in a species aquarium, organized according to its needs. Description of the parameters of the habitat: Total hardness is from 0.2 to 1.4 dGH, carbonate hardness is from 0 to 1.4 dGH, average pH value is below 6.0, there are no nitrates there. List of fishes and invertebrates occurring in the nature biotope: Hemirhamphodon pogonognathus, Betta waseri, B.imbellis, B.tussyae, Luciocephalus pulcher, Nandus nebulosus, Kryptopterus macrocephalus, Boraras maculatus, Rasbora eithovenii, Belontia hasselti, Trigonopoma pauciperfatum. List of plants found in the nature biotope: Сryptocoryne auriculata Engler, Criptocoryne bullosa, Criptocoryne usteriana. Threats to the ecology: The creation of this biotope is motivated by attention to the environmental problems of the region. It, for example, was shown in the publication “Thousands of fish die in Barito River in Indonesia” dated May 6, 2018. (https://yamkin.com/2018/05/06/thousands-of-fish-die-in-barito-river-in-indonesia/): “The environmental agency of North Barito do test samples of water of the Barito River in three point locations of sampling of water in the region of North Barito Regency, Central Kalimantan and determines the quality of the water The Barito River still meet the requirements of quality raw. “Based on the test results of the water samples of the Barito River in three locations for aspects of the pH (potential hydrogen), DHL (electrical conductivity), COD (chemical oxygen levels), DO (oxygen levels) and TDS (solid terlaut) still meets the raw quality,” said the head of the The environmental agency of the Barito Utara, Muara Teweh Suriawan Prihandi on Sunday. As for the value of the TSS (Total Suspended Solution) exceeds the raw quality required, he added. “Sampling water Creek related thousands of fingerlings belonging to residents who died on the weekend,” said Suriawan. According to Suriawan, factors cause high TSS value due to the speed of the water flow, erosion or sedimentation, water waste, organic waste and nonorganik. 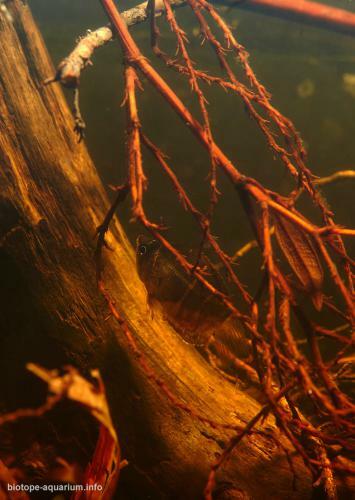 With the high value of the TSS also affect the penetration of light or reduced light that penetrates the water, so that the process of photosynthesis becomes obstructed so that it could lead to decreased levels of dissolved oxygen (DO), where the value of the DO low may cause the death of fish. 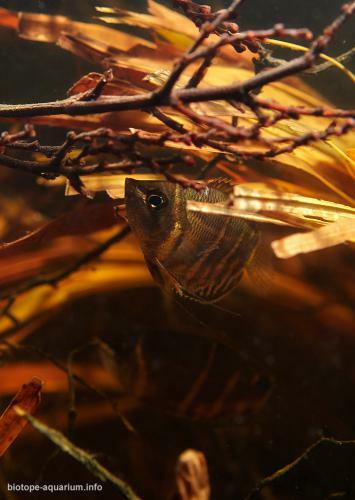 “The increase in the temperature of the water increases the temperature of the water can also cause a decrease in DO, so also can disrupt the life water biota including fish group,” he said. — Пыльцына Е.Е. «Аквариум. Новая современная энциклопедия». — М., 2011. — Ганс Й. Майланд «Аквариум и его обитатели». – М., 1998. — Kottelat, M., A.J. Whitten, S.N. Kartikasari and S. Wirjoatmodjo, 1993. Freshwater fishes of Western Indonesia and Sulawesi. Periplus Editions, Hong Kong.